BALTIMORE, Maryland, January 9, 2015 (ENS) – The trashy litter in Baltimore area streams and the city’s harbor must be removed under new pollution limits set by federal and state regulators, the U.S. Environmental Protection Agency announced Tuesday. The City of Baltimore and Baltimore County are required to prevent hundreds of tons of garbage from being washed or dumped every year into the upstream watersheds of Jones Falls, Gwynns Falls and the lower Patapsco River. If prevention is not possible, the trash or debris must be removed under the limits jointly approved by EPA and the Maryland Department of the Environment. These limits, also known as a Total Maximum Daily Load or TMDL, require the control of trash entering the tidal shoreline of the Middle Branch and Northwest Branch of the Patapsco River, including Baltimore Harbor. Each year, hundreds of tons of rubbish are washed into the Patapsco watershed from stormwater runoff, or dumped into the watershed, creating a nuisance and an eyesore, and endangering birds, fish and other wildlife that ingest or become entangled in the mess. The federal Clean Water Act directs states to develop TMDLs for impaired water bodies, such as the Patapsco River. A TMDL establishes the amount of a pollutant, in this case trash, which a water body can assimilate without exceeding water quality standards. TMDLs provide the basis for establishing water quality-based controls, reducing pollution from both point and nonpoint sources and restoring the quality of water resources. “As a life-long resident of Baltimore, I am very pleased with and proud of the work done by MDE’s Science Services Administration, in cooperation with the Baltimore City Department of Public Works, to take this important regulatory action,” said Maryland Department of Environment Secretary Robert Summers. “With the ongoing rejuvenation of the waterfront around Baltimore Harbor and the Patapsco River, a growing number of Marylanders and tourists are enjoying our waterways every year, and this TMDL for trash and the cleanup actions the city will take as a result are a big step forward for residents, visitors, water quality and the environment,” said Summers. 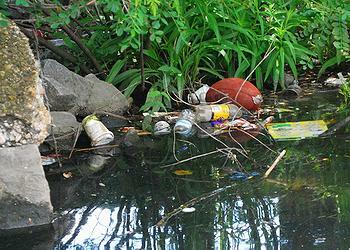 In 2008, Maryland included portions of the tidal Patapsco River shorelines on its list of impaired waters due to excessive quantities of trash and debris. To complement this TMDL, the Maryland Department of the Environment is implementing the limits of these TMDLs through recently issued stormwater permits to local governments that will include trash collecting in the waterbody as well as reducing trash dumping at the source. The Maryland Department of Environment along with members of several nongovernmental organizations have worked with EPA in the completion of this series of trash TMDLs.